The sensational tabloid story of Fabian Cancellara's supposed mechanically assisted victories at this year's Tour of Flanders and Paris-Roubaix has reached a fever pitch. The views on YouTube of Cancellara's alleged use of a mechanical aid, the Gruber Assist, to win the historic double are climbing toward 2 million. I cannot speak for the theory posited that a mechanically assisted bike could be used to power one of Cancellara's bikes throughout the early stages of the race. I can, however, address the video's specific assertion that Cancellara could have used a Gruber Assist to power away from Tom Boonen on the Muur in the finale of what was an incredible Ronde van Vlaanderen. I had the opportunity to spend some quality time with the bike the night of Fabian's victory. I, along with Zipp's Ernie Calderin, took the bike out to the Vlaamse Ardennen to take some pictures for an article. I picked up the bike, touched the bike, inspected the bike, top to bottom, left to right, every which way. There was absolutely no indication of anything untoward. I took pictures of every part of the bike as well, and those tell the same tale: no indication whatsoever of any modifications. I can say that there was absolutely nothing on the bike that lends credence to the idea that a Gruber Assist was in use on Cancellara's race winning bike. That's just my own personal experience. 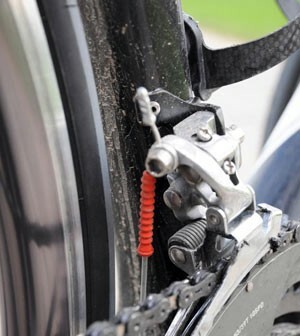 Far more important than that, however, is the critically important detail of seatpost diameter. The Specialized Tarmac SL3 takes a 27.2 mm seatpost, not a 31.6. the Gruber Assist requires a 31.6 mm diameter opening, rendering it utterly useless unless Cancellara was riding a special bike, which I can say is definitely not the case. It was clear that he was riding a 27.2 mm seatpost. The Gruber Assist, though light at 900 grams, is still a substantial sum to add to a ProTour level bike. Cancellara's Flanders winning Specialized Tarmac SL3 was light, almost frighteningly so. I can't give an exact number, but I can say with confidence that that bike was close to the UCI limit of 6.8 kg with its original Zipp 303 wheelset attached. 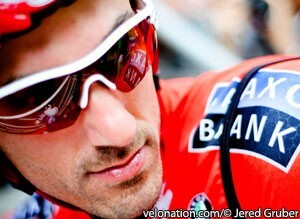 The UCI, never one to avoid investigations, is not investigating the claims against Cancellara. However, UCI president, Pat McQuaid, is taking no chances for the future and says that "there will be a meeting Monday at the headquarters in Aigle between our experts and representatives of the manufacturers." The story is absolutely a cycling myth. It's a humorous video if taken as a joke. It takes on a decidedly more ominous tone, however, when it's considered as a possibility. If Cancellara's accelerations are suddenly put into question as uncharacteristic, do we need to be reminded of what he has done in the past? Cancellara has made a career of powerful accelerations that no one can touch. Remember his move at Milan-Sanremo a few years ago that netted him his first win at La Primavera? What about that time he held off an entire cadre of the world's best sprinters when he duped them all whilst in the Maillot Jaune at the Tour de France? The list goes on and on and on. The sport of cycling has more than enough problems to deal with in doping, let's not add to the woes by creating non-existent new ones. 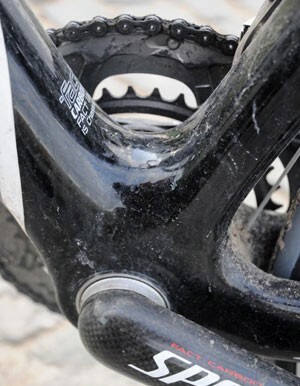 The possibility of mechanical doping is certainly there; the video proves that, but it doesn't do anything but disprove that Fabian Cancellara did. "My experience within the sport tells me that to cheat blatantly in such a way would be such a massive step for those concerned - and it would involve so many members of the backup team and staff - that although it is possible it probably hasn't taken place yet for real. Just because you 'can' doesn't mean to say you 'do'. Any rider, squad and sponsors involved with a team caught in this way would be dead in the water as far as cycling is concerned. There would be absolutely zero sympathy and no way back into the sport whatsoever." "Only desperate people would take that step and there have historically been the odd instance in sport. I suppose the most famous was Boris Onischenko rigging up his sword to score hits at will at the modern pentathlon in 1976. You never say never so it's right we are on our guard." View the complete photo album of Fabian Cancellara's race winning bike with full-sized images.